Mercedes-Benz will debut the AMG GT at the Paris Motor Show in October. 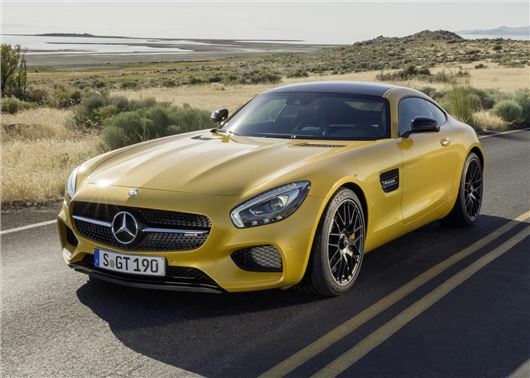 The AMG GT is expected to cost around £95,000, with the S version £10,000-£15,000 more. The new sports car will become the manufacturer’s halo model when it reaches the UK in April 2015. The two-seat coupe is powered by a 4.0-litre twin-turbo V8 engine in two states of tune: 462PS in the GT and 510PS in the range-topping GT S model. The former version is capable of getting to 62mph from rest in 4.0 seconds, while the more powerful GT S does it in 3.8 seconds. They have 189mph and 193mph top speeds respectively. And in a nod to market stereotypes, Mercedes-Benz has also ensured that the AMG GT includes a relatively enormous, highly Golf-friendly 350-litre boot space, accessed by a hatchback. It’s surprisingly frugal, too, registering 30.4mpg on the official numbers or 30.1mpg in the GT S.
This is the second model to be developed entirely in-house by Mercedes-Benz’s high-performance division, AMG. It follows the SLS AMG, production of which recently ended. However, the AMG GT is not a direct replacement for that car, with AMG stepping down the supercar ladder by a rung or two this time and pitching its latest effort closer to the Porsche 911 Turbo. Proportionally, the Mercedes-Benz AMG GT is quite close to the Porsche 911, though slightly more dramatic by virtue of being slightly longer, wider and lower. It’s also considerably lighter – 1540kg against the 1670kg 911 Turbo – which Mercedes-Benz claims is down to extensive use of aluminium in the chassis. It’s a quite decadent thing on the inside though, decked out in leather, aluminium and carbon fibre. The high-set centre console features bridged sections that house the main controls, while an 8.4-inch high-resolution screen performs the central display function. Built in Mercedes-Benz’s AMG facility in Sindelfingen, where the entire AMG division is based and can usually be found hand-building engines to shoehorn into regular cars, the AMG GT is rear-wheel drive, sending power there via a seven-speed dual-clutch transmission. Weight distribution is slightly rear biased – 53 percent over the back axle – and while both cars get a proper mechanical rear limited-slip differential, the GT S version’s is electronically controlled, which Mercedes-Benz says makes it even quicker to respond. The engine is brand new, with AMG slotting the two turbochargers inside the V created by the two cylinder banks – a configuration that the company says is groundbreaking and which it calls “hot inside V”. Each engine will be assembled by hand and stamped with the maker’s signature, as is the AMG way. GT S versions get electrically controlled damping adjustable three ways, called AMG Ride Control, though in the standard GT that’s a cost option. Sideways enthusiasts will be pleased to note that the electronic stability control can be switched off entirely, while aerodynamic stability is enhanced by an electronically adjustable rear wing.